Alexander I (Russian: Александр Павлович, Aleksandr Pavlovich; 23 December [O.S. 12 December] 1777 – 1 December [O.S. 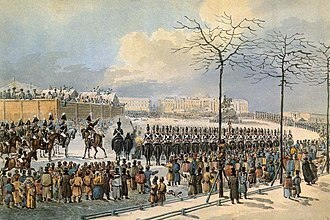 19 November] 1825[a]) reigned as Emperor of Russia between 1801 and 1825. He was the eldest son of Paul I and Sophie Dorothea of Württemberg. 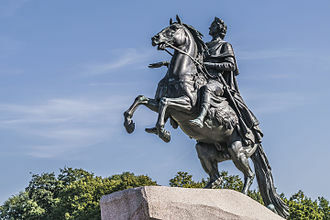 Alexander was the first Russian King of "Congress" Poland, reigning from 1815 to 1825, as well as the first Russian Grand Duke of Finland, reigning from 1809 to 1825. 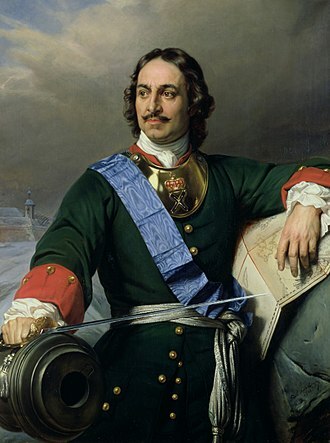 He was born in Saint Petersburg to Grand Duke Paul Petrovich, later Emperor Paul I, and succeeded to the throne after his father was murdered. He ruled Russia during the chaotic period of the Napoleonic Wars. As prince and during the early years of his reign, Alexander often used liberal rhetoric, but continued Russia's absolutist policies in practice. 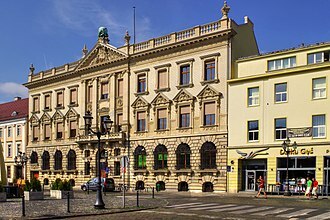 In the first years of his reign, he initiated some minor social reforms and (in 1803–04) major, liberal educational reforms, such as building more universities. Alexander appointed Mikhail Speransky, the son of a village priest, as one of his closest advisors. The Collegia was abolished and replaced by the State Council, which was created to improve legislation. Plans were also made to set up a parliament and sign a constitution. In foreign policy, he changed Russia's position relative to France four times between 1804 and 1812 among neutrality, opposition, and alliance. In 1805 he joined Britain in the War of the Third Coalition against Napoleon, but after suffering massive defeats at the battles of Austerlitz and Friedland he switched and formed an alliance with Napoleon by the Treaty of Tilsit (1807) and joined Napoleon's Continental System. He fought a small-scale naval war against Britain between 1807 and 1812 as well as a short war against Sweden (1808–09) after Sweden's refusal to join the Continental System. Alexander and Napoleon hardly agreed, especially regarding Poland, and the alliance collapsed by 1810. The tsar's greatest triumph came in 1812 as Napoleon's invasion of Russia proved a total disaster for the French. As part of the winning coalition against Napoleon he gained some spoils in Finland and Poland. He formed the Holy Alliance to suppress revolutionary movements in Europe that he saw as immoral threats to legitimate Christian monarchs. He helped Austria's Klemens von Metternich in suppressing all national and liberal movements. In the second half of his reign he was increasingly arbitrary, reactionary and fearful of plots against him; he ended many earlier reforms. He purged schools of foreign teachers, as education became more religiously oriented as well as politically conservative. Speransky was replaced as advisor with the strict artillery inspector Aleksey Arakcheyev, who oversaw the creation of military settlements. Alexander died of typhus in December 1825 while on a trip to southern Russia. He left no children, as his two daughters died in childhood. Both of his brothers wanted the other to become emperor. After a period of great confusion (that presaged the failed Decembrist revolt of liberal army officers in the weeks after his death), he was succeeded by his younger brother, Nicholas I. Empress Catherine had Alexander Palace built for the couple. This did nothing to help his relationship with her, as Empress Catherine would go out of her way to amuse them with dancing and parties, which annoyed his wife. Living at the palace also put pressure on him to perform as a husband, when he only had a brother's love for the Grand Duchess. He began to sympathize more with his father, as he saw visiting his father's fiefdom at Gatchina as an escape from the ostentatious court of the empress. 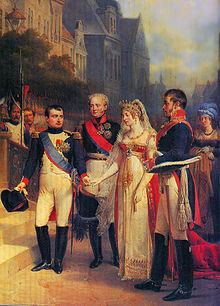 There, they wore simple Prussian military uniforms, instead of the gaudy clothing popular at the French court they had to wear when visiting Empress Catherine. Even so, visiting the tsarevich did not come without a bit of travail. Paul liked to have his guests perform military drills, which he also pushed upon his sons Alexander and Constantine. He was also prone to fits of temper, and he went into fits of fury when his will was thwarted. 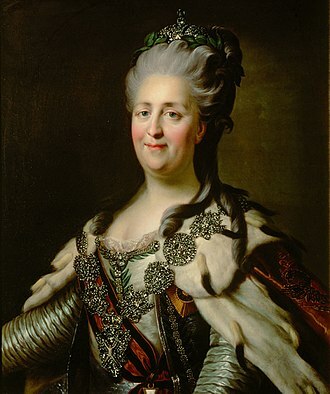 The death of Catherine in November 1796, before she could appoint Alexander as her successor, brought his father, Paul I, to the throne. Alexander disliked him as a ruler even more than he did his grandmother. He wrote that the country had become a "plaything for the insane" and that "absolute power disrupts everything". It is likely that seeing two previous rulers abuse their autocratic powers in such a way pushed him to be one of the more progressive Romanov czars of the 19th and 20th centuries. Among the rest of the country, Paul was immensely unpopular. He accused his wife of conspiring to become another Catherine II and seize power from him as his mother did from his father. He also suspected Alexander of conspiring against him, despite his son's earlier refusal to Catherine II to seize power from Paul. In the summer of 1812 Napoleon invaded Russia. It was the occupation of Moscow and the desecration of the Kremlin, the sacred centre of Holy Russia, that changed his sentiment for Napoleon into passionate hatred. [b] The campaign of 1812 was the turning point of Alexander's life; after the burning of Moscow, he declared that his own soul had found illumination, and that he had realized once and for all the divine revelation to him of his mission as the peacemaker of Europe. Alexander I, Francis II of Austria and Frederick William III of Prussia meet after defeating Napoleon at the Battle of Leipzig. The Coalition forces, divided into three groups, entered northeastern France in January 1814. Facing them in the theatre were the French forces numbering only about 70,000 men. In spite of being heavily outnumbered, Napoleon defeated the divided Coalition forces in the battles at Brienne and La Rothière, but could not stop the Coalition's advance. The Austrian emperor Francis I and King Frederick William III of Prussia felt demoralized upon hearing about Napoleon's victories since the start of the campaign. They even considered ordering a general retreat. But the Tsar Alexander I was far more determined than ever to victoriously enter Paris whatever the cost, imposing his will upon Schwarzenberg, and the wavering monarchs. 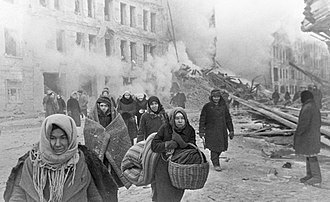 On 28 March, the Coalition forces advanced towards Paris, and the city surrendered on 31 March. Until this battle it had been nearly 400 years since a foreign army had entered Paris, during the Hundred Years' War. Camping outside the city on 29 March, the Coalition forces were to assault the city from its northern and eastern sides the next morning on 30 March. The battle started that same morning with intense artillery bombardment from the Coalition army. 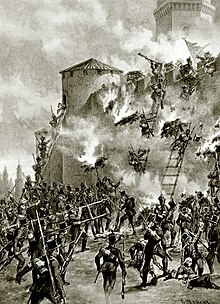 Early in the morning the Coalition attack began when the Russians attacked and drove back the French skirmishers near Belleville before themselves driven back by French cavalry from the city's eastern suburbs. 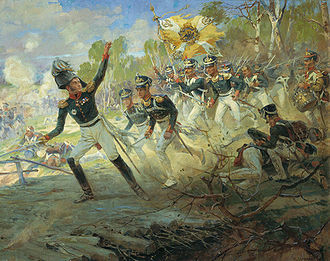 By 7:00 a.m. the Russians attacked the Young Guard near Romainville in the center of the French lines and after some time and hard fighting pushed them aback. 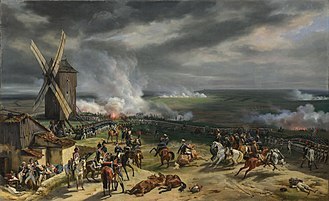 A few hours later the Prussians, under Blücher, attacked north of the city and carried the French position around Aubervilliers, but did not press their attack. The Württemberg troops seized the positions at Saint-Maur to the southwest, with Austrian troops in support. The Russian forces then assailed the Montmartre Heights in the city's northeast. Control of the heights was severely contested, until the French forces surrendered. Alexander I sent an envoy to meet with the French to hasten the surrender. He offered generous terms to the French and, although having intended to avenge Moscow, declared himself to be bringing peace to France rather than its destruction. On 31 March Talleyrand gave the key of the city to the Tsar. Later that day the Coalition armies triumphantly entered the city with the Tsar at the head of the army followed by the King of Prussia and Prince Schwarzenberg. On 2 April, the Senate passed the Acte de déchéance de l'Empereur, which declared Napoleon deposed. Napoleon was in Fontainebleau when he heard that Paris had surrendered. Outraged, he wanted to march on the capital, but his marshals refused to fight for him and repeatedly urged him to surrender. 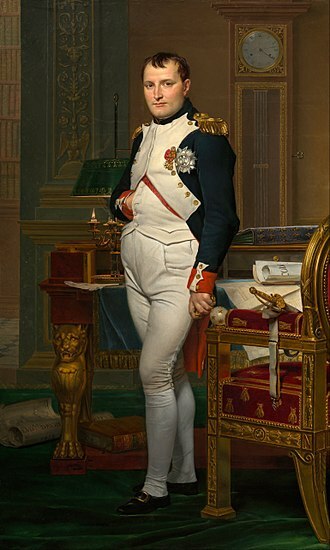 He abdicated in favour of his son on 4 April, but the Allies rejected this out of hand, forcing Napoleon to abdicate unconditionally on 6 April. The terms of his abdication, which included his exile to the Isle of Elba, were settled in the Treaty of Fontainebleau on 11 April. A reluctant Napoleon ratified it two days later. The War of the Sixth Coalition was over. His mental health deteriorated. He grew increasingly suspicious of those around him, more withdrawn, more religious, and more passive. Some historians conclude his profile "coincides precisely with the schizophrenic prototype: a withdrawn, seclusive, rather shy, introvertive, unaggressive, and somewhat apathetic individual." In the autumn of 1825 the Emperor undertook a voyage to the south of Russia due to the increasing illness of his wife. During his trip he himself caught a cold which developed into typhus from which he died in the southern city of Taganrog on 19 November (O.S. )/ 1 December 1825. 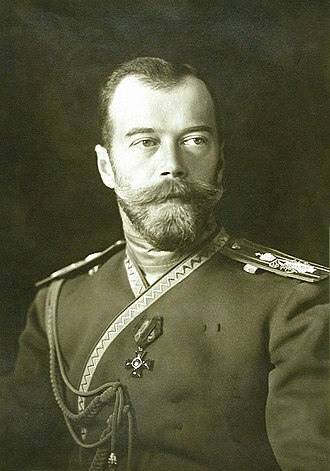 His two brothers disputed who would become tsar—each wanted the other to become tsar. Rumours circulated for years that he had not died but had become the monk Feodor Kuzmich. His wife died a few months later as the emperor's body was transported to Saint Petersburg for the funeral. 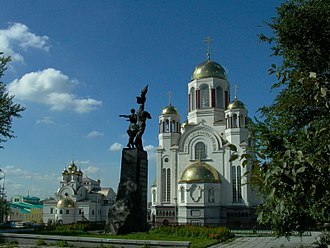 He was interred at the St. Peter and Paul Cathedral of the Peter and Paul Fortress in Saint Petersburg on 13 March 1826. Alexander's supposed non-death is as controversial as his life. There were many rumors and legends of which the most often told claimed he became a Siberian Hermit named Feodor Kuzmich. Historians reject the legends, but popular writers resurrect them often. ^ "Alexander I | emperor of Russia". Encyclopedia Britannica. Retrieved 2018-01-24. ^ "Biography of Emperor Alexander I of Russia". Saint-petersburg.com. Retrieved 2019-02-02. This article incorporates text from a publication now in the public domain: Phillips, Walter Alison (1911). "Alexander I." . In Chisholm, Hugh. Encyclopædia Britannica. 1 (11th ed.). Cambridge University Press. pp. 556–559. The Holy Alliance was a coalition created by the monarchist great powers of Russia and Prussia. It was created after the defeat of Napoleon at the behest of Tsar Alexander I of Russia. 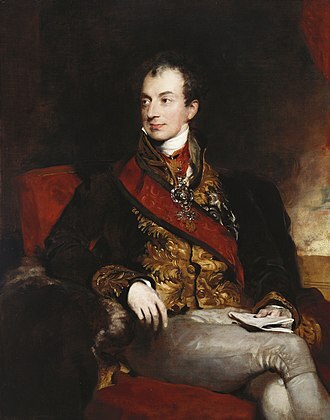 Despite this noble wording, the Alliance was not only rejected as non-effective by the United Kingdom, but by the Papal States, in practice, the Austrian state chancellor Prince Klemens von Metternich made it a bastion against democracy and secularism. The monarchs of the three countries involved used this to band together in order to prevent revolutionary influence from entering these nations. At the 1820 Congress of Troppau and the succeeding Congress of Laibach, Metternich tried to align his allies in the suppression of the Carbonari revolt against King Ferdinand I of the Two Sicilies. The Quintuple Alliance met for the last time at the 1822 Congress of Verona to strive against the Greek Revolution, the last meetings had revealed the rising antagonism with Britain and France, especially on Italian unification, the right to self-determination and the Eastern Question. The Continental System or Continental Blockade was the foreign policy of Napoleon I of France in his struggle against Great Britain during the Napoleonic Wars. It ended on 11 April 1814 after Napoleons first abdication, as Napoleon realized that extensive trade was going through Spain and Russia, he invaded those two countries. His forces were tied down in Spain — in which the Spanish War of Independence was occurring simultaneously — and suffered severely in, the Berlin Decree forbade the import of British goods into European countries allied with or dependent upon France, and installed the Continental System in Europe. All connections were to be cut, even the mail, British merchants smuggled in many goods and the Continental System was not a powerful weapon of economic war. There was some damage to British trade, especially in 1808 and 1811, the loss of Britain as a trading partner hit the economies of France and its allies. Angry governments gained an incentive to ignore the Continental System, which led to the weakening of Napoleons coalition, Great Britain was the central important force in encouraging and financing alliances against Napoleonic France. In addition, the British government enacted a naval blockade of the French and French-allied coasts, as France lacked the naval strength to invade Britain or to decisively defeat the Royal Navy at sea, Napoleon resorted instead to economic warfare. Britain was Europes manufacturing and business center as a result of the Industrial Revolution, Napoleon believed it would be easy to take advantage of an embargo on trade with the European nations under his control, causing inflation and great debt to undermine the British strength. The UK responded with the Orders in Council of 1807 issued 11 November 1807 and these forbade French trade with the UK, its allies or neutrals, and instructed the Royal Navy to blockade French and allied ports. Napoleon retaliated with the Milan Decree of 1807, which declared that all neutral shipping using British ports or paying British tariffs were to be regarded as British, Napoleons plan to defeat Britain was to destroy its ability to trade. As an island nation, trade was its most vital lifeline, Napoleon believed that if he could isolate Britain economically, he would be able to invade the nation after its economic collapse. Taganrog is a port city in Rostov Oblast, located on the north shore of the Taganrog Bay in the Sea of Azov, several kilometers west of the mouth of the Don River. As of the 2010 Census, its population was 257,681, Taganrog was officially founded by Peter the Great on September 12,1698. The first Russian Navy base, it hosted the Azov Flotilla of Catherine the Great, Taganrog was granted city status in 1775. By the end of the 18th century, Taganrog had lost its importance as a base after Crimea. In 1802, Tsar Alexander I granted the city special status, in 1825, the Alexander I Palace in Taganrog was used as the Tsars summer residence, where he died in November 1825. Taganrog became an important as a port, used for the import and export of grain by the end of the 19th century until the early 20th century. Industrialization increased in the city when Belgian and German investors founded a factory, an iron and steel foundry, a leather factory. 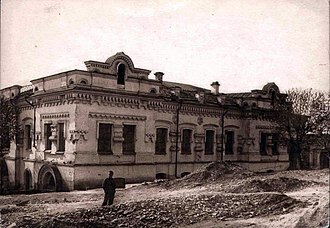 By 1911, fifteen foreign consulates had opened in the city, during World War I, Taganrog was occupied by the troops of the German Army from May 1918 until August. In 1919, General Anton Denikin established his headquarters at the Avgerino mansion in the city while commanding White Russian troops fighting in South Russia during the Russian Civil War. When the White Russians were defeated and Bolshevik power was established in the city on December 25,1919, Denikins remaining troops and the British Consulate were evacuated by HMS Montrose. The occuption led to the government system being replaced by German-style Bürgermeisteramt. Within the framework of administrative divisions, it is incorporated as Taganrog Urban Okrug—an administrative unit with the equal to that of the districts. As a municipal division, this unit has urban okrug status. The climate of Taganrog is temperate, Taganrog experiences moderately cold winters and hot summers. Taganrog is the industrial center of Rostov Oblast. The biggest company currently operating in Taganrog is Taganrog Metallurgical Plant which manufactures steel, steel pipe for oil and gas industry, the other major employer is Taganrog Auto Factory which originated from Taganrog Combine Harvester Factory. Nicholas I was the Emperor of Russia from 1825 until 1855. He was the King of Poland and Grand Duke of Finland and his biographer Nicholas V. Riasanovsky says that Nicholas displayed determination, singleness of purpose, and an iron will, along with a powerful sense of duty and a dedication to very hard work. He saw himself as a junior officer totally consumed by spit. A handsome man, he was nervous and aggressive. Trained as an engineer, he was a stickler for minute detail, in his public persona, says Riasanovsky, Nicholas I came to represent autocracy personified, infinitely majestic and powerful, hard as stone, and relentless as fate. His reign had an ideology called Official Nationality that was proclaimed officially in 1833 and it was a reactionary policy based on orthodoxy in religion, autocracy in government, and Russian nationalism. He was the brother of his predecessor, Alexander I. Nicholas inherited his brothers throne despite the failed Decembrist revolt against him and his aggressive foreign policy involved many expensive wars, having a disastrous effect on the empires finances. He was successful against Russias neighbouring southern rivals as he seized the last territories in the Caucasus held by Persia by successfully ending the Russo-Persian War and he ended the Russo-Turkish War successfully as well. Later on, however, he led Russia into the Crimean War with disastrous results, historians emphasize that his micromanagement of the armies hindered his generals, as did his misguided strategy. Fuller notes that historians have concluded that the reign of Nicholas I was a catastrophic failure in both domestic and foreign policy. On the eve of his death, the Russian Empire reached its zenith, spanning over 20 million square kilometers. Nicholas was born at Gatchina Palace in Gatchina to Grand Duke Paul, five months after his birth, his grandmother, Catherine the Great and his parents became emperor and empress of Russia. He was a brother of Emperor Alexander I of Russia, who succeeded to the throne in 1801. Riasanovsky says he was, the most handsome man in Europe, Nicholas was not brought up to become the Emperor of Russia, he had two elder brothers. Czartoryski, as Tsar Alexander's foreign minister, was key in forming the Third Coalition against France. Marie Palace on St. Isaac's Square was the seat of the State Council in the 20th century. The centenary session of the State Council in the Marie Palace on May 7, 1901, is represented on Ilya Repin's huge canvas (detail shown), now exhibited in the Russian Museum.